The keynote just wrapped here at Microsoft's TechEd conference in Orlando. A packed audience listened eagerly to hear a roadmap of upcoming releases and product announcements from the software giant. 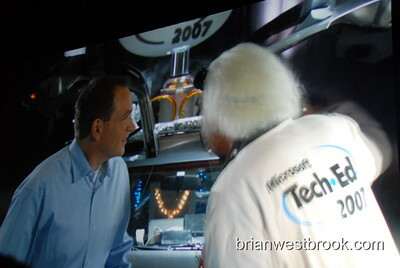 Microsoft SVP Bob Muglia appeared on stage with actor Christopher Lloyd of the “Back to the Future” series after a splashy and entertaining video introduction poking fun at previous keynotes (and unrealized “vision”) -- and making light of failed Microsoft Products (the other Bob and his sidekick Clippy). Christopher Lloyd took on the role of “MS-BS Detector” promising to sound a honking noise if the keynote were to drift into “vision” territory. The gimic was certainly memorable, but the keynote itself? Not so much. Microsoft has acquired Engyro Corp.
Office Business Applications include Open XML – an SDK was released today. ”Katmai” is now officially Microsoft SQL Server 2008. ”Orcas” is now Visual Studio 2008 with a Beta2 available later this summer. The session ended with video montage timeline respective loook at Microsoft TechEd over the past 15 years. For more on Microsoft TechEd, check back soon or visit Microsoft’s Virtual TechEd site. I took some photos of Bob Muglia and Christopher Lloyd onstage from the press row and will post them here in a few minutes.